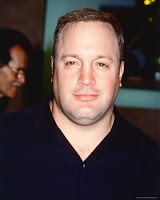 The Beantown Bloggery: Kevin James in a New MMA Movie? This is going to be entertaining. Word on the street is that Kevin James is coming back to film another movie in MA next year and it's going to be a mixed martial arts film. Sounds like Kung Fu Panda set in real life. Especially if he fights an actual UFC fighter and wins. My choice? GSP or BJ Penn. 1 Response to "Kevin James in a New MMA Movie?" I think Kevin James playing a MMA fighter would be hilarious. Big UPS to Kevin James.